Ang Larawan became the early "nominee" for one of the more serious films in the 2017 Metro Manila Film Festival that took to social media early to call for support in my book as by the even of Day One they were already posting about which theaters would no longer be showing the movie. This isn't good or bad in itself - just a practice that has become a regular thing when it comes to independent movies. The movie has managed to extend its life a bit more with the help of the many awards it won at the MMFF including Best Picture. But it doesn't change how the movie isn't necessarily "accessible" to a wider audience, nor should it have compromised on quality just to achieve that goal. The movie also happens to be a muscal of sorrts, but one that doesn't quite follow the usual sort of Rodgers and Hammerstein format for such musicals in terms of having strong songs to balance out straight dialog scenes. If anything, the movie does attempt to be nearly sung through from start to finish but whether that was a good idea is something the individual viewer will need to decide for themselves. 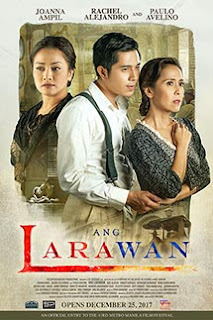 Synopsis: Ang Larawan (The Portrait) is a Filipino musical movie directed by Loy Arcenas. The screenplay was written by Rolando Tinio (as based on the 1997 stage play Ang Larawan the Musical) which was based on The Portrait of the Artist as Filipino by National Artist Nick Joaquin. The movie is set in pre-World War II Intramuros and starts with young Bitoy (Sadino Martin) visiting the Marasigan household. He had used to visit as a child and the sisters Paula (Rachel Alejandro) and Candida (Joanna Ampil) are initially happy to receive a visit from an old friend of the family. But it turns out that Bitoy is a report and like everyone he has come to see the painting - the last creation of the Marasigan father Don Lorenzo "the Magnificent". The family has fallen on hard times and Lorenzo has not left his room ever since an accident explained in the movie. Paula and Candida do their best to support themselves mostly on their own with some hand-outs from their older siblings, Manolo (Nonie Buencamino) and Pepang (Menchu Lauchengco-Yulo) and the limited rent from their boarder, Tony Javier (Paulo Avelino). But the pressure is on to find ways to make ends meat with Tony also brokering for an American who wants to buy the painting while Manolo and Pepang want to sell the house and devide the sisters between them. What I Liked: There is no faulting the original Nick Joaquin story that still drives this movie as a complex tale of Old Manila and old Philippine High Society through the Marasigan sisters. It's a classic story of the "old rich" trying to cling to past glories and not wanting to lose face with the neighbors. But it's also a complex examination of identity as individuals and perhaps as a Filipino or the struggles of artists. There are many facets to this narrative. The movie also felt rather brave in its approach to bring this particular form of the story to the screen as it's definitely not your typical sort of musical. While it is a story set to music, it is perhaps closer in structure to an opera that what we more commonly know as a musical and their commitment to this structure is pretty admirable indeed. And you can tell that a love of care and attention went into the crafting of this movie and the end result is certainly striking and memorable. What Could Have Been Better: In the somewhat the same way that Maynila Sa Mga Kuko ng Liwanag was an odd stage musical adaptation of a movie that was directed like a movie/television production, Ang Larawan felt like a movie based on a stage musical that had been directed somewhat more like a stage play, but not a very good one. Blocking was one of the biggest issues here as people ended up doing a lot of standing around, mostly in the forced blurry background while a single character had the spotlight. They'd wait out of view and reappear suddenly when it came time to deliver lines amid quick cuts to yet another close-up of a face. The whole musical approach didn't quite translate well as a movie for me as a lot of times it felt like people were just making exclamations while music would play incidentally. This was punctuated by odd bits of straight dialog with no clear pattern of why one would sing one moment add then talk the next. It's not a musical that is easy to get into as it has no really distinct "songs" to latch on to for meaning. Instead there's just a single general melody or tone to things that is shaped around the libretto. And thus the whole opera comparison, but not meant in a good way. TL;DR: Ang Larawan is still a good musical but it's one that doesn't feel like it was directed in a manner to tell the story to maximum effect. There are so many ways the story could have tightened up through better blocking, editing or a little movie magic here and there. Thus the movie gets 3.5 unexpected musical exclamations out of a possible 5.